Some have asked how to power up a Power Supply Unit without connecting it to the motherboard. We will show you how, however please read properly before you execute and take extra caution while shorting the pins. This is what you need, a wire with both ends striped. Two PSU were used for this illustration. 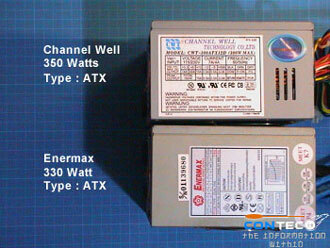 This was taken from Enermax Guide Book. 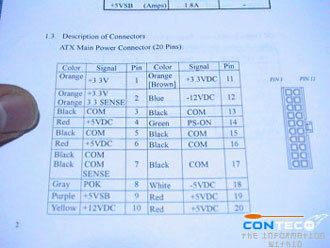 It serves as a pointer to which color of the PSU to which pin number. Please take this as a reference. This info was taken from the web OCshoot. I got this info but to enchance with details. 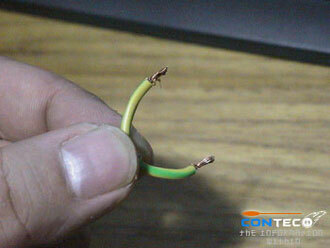 The color cables from a CWT PSU matches the Enermax Guide book. To comfirm that the guide from the Enermax are standard, The connectors are from an Enermax PSU. Infact HEC and Delta PSU are of the same layout. Please do not turn on the power before you short the pins. 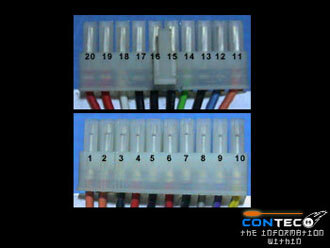 What you need to do is to short pin 8(Gray) and 14(Green) with the strip wires. I choose to use this than to a paper clips because, paper clips are conductive and it’s better safe then sorry. once you have shorted the pin, now you can turn on the power. If you do it correctly, your PSU fan will start to spin, indicating that it’s already powered up.